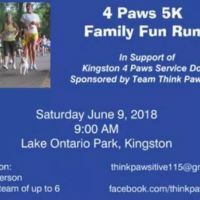 The 4 Paws 5K Family Fun Run takes place at Lake Ontario Park on June 9th. It’s in support of Kingston 4 paws Service Dogs. It’s $20 per person or $60 for a team/family. There will be kids activities, a post run BBQ, live entertainment and more.